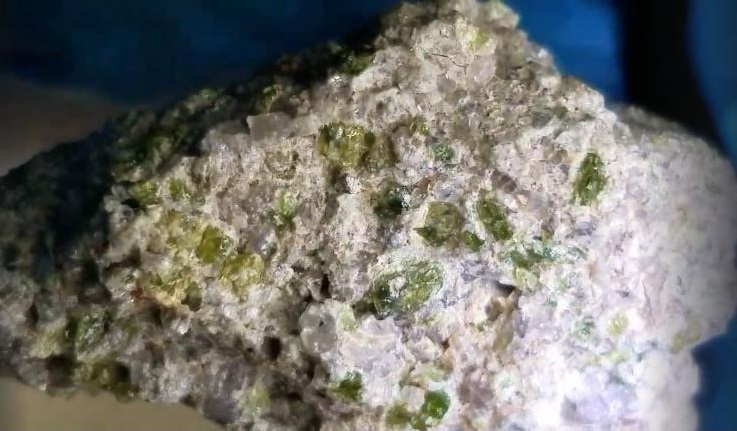 Thirty-five separate pieces of a meteorite having a combined weight of 345 g, some exhibiting a unique and attractive chartreuse-colored fusion crust, were found near a well known by local hunters as Bir Abbass, located near Asrifa, Morocco (per H. C. Aoudjehane). These stones were subsequently purchased by S. Ralew in April 2012 from a dealer in Erfoud, Morocco. A type sample was submitted by Mr. Ralew to the University of Washington in Seattle (A. Irving and S. Kuehner) for analysis and classification and NWA 7325 was determined to be a new ungrouped achondrite. Numerous additional paired fragments from this fall have since been recovered, including 210 g NWA 8014 acquired by N. Jain, 3.23 g NWA 8268 acquired by R. Lenssen, 82.37 g NWA 8353 acquired by S. Perekslis, numerous stones totalling 433.9 g constituting NWA 8409 (main mass photo on poster by Hoffmann et al., 2018; high-res interior view courtesy of Peter Marmet), 43.81 g NWA 8486 acquired by R. Garcia, and many visually obvious pairings not yet analyzed and given a NWA-series designation (e.g., larger masses weighing 211 g, 86 g, and 43 g (NWA 8486? ); a 27.83 g stone exceptionally photographed in high-res by M. Ouzlou showing the true color and texture of the unique fusion crust; plus obvious smaller paired stones acquired by Morrocan ebay seller "ayoubhaddououmoussa" weighing 10 g, 7.5 g, 2 g, and 2 g). Northwest Africa 7325 has been described by the primary investigative team as a reduced, cumulate olivine microgabbro (typical grain size 0.51 mm), having petrographic characteristics that are distinct from all other known meteorites. They recognized that this meteorite has a unique composition, consisting primarily of optically anisotropic calcic plagioclase (~56 vol%), bright green-colored AlCr-bearing diopside (~27 vol%), and forsteritic olivine (~16 vol%), together with trace abundances of Cr-bearing troilite which in rare instances is associated with the mineral eskolaite. Infrared and Raman spectroscopy performed by Weber et al. (2014) also indicates that the plagioclase consists of the Ca-rich endmember anorthite, and that the olivine is Mg-rich endmember forsterite, while Hasegawa et al. 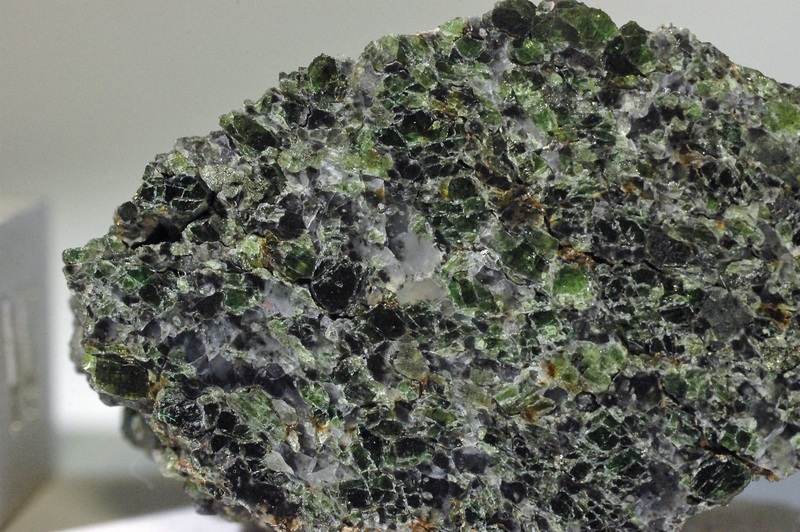 (2014) report that the pyroxene consists of near endmember diopside. In addition, a high abundance of P was observed in some accessory phases. Sporadic grains of FeNi-metal (taenite), magnesiochromite, and magnetite also occur, while the presence of calcite along grain boundaries has been attibuted to terrestrial alteration proccesses (Weber et al. (2015). Many characteristics of this meteorite (e.g., Al/Si and Mg/Si major element ratios) have been favorably compared to those associated with the innermost planet Mercury, as characterized by the MESSENGER orbital spacecraft (Irving et al., 2013). The optical properties of the plagioclase, described as having a "frosty" or "cloudy" appearance, are consistent with one or more shock events on the parent body. In a microscopic examination of the plagioclase, Hasegawa et al. (2014) described microlite domains measuring ~10 µm within the otherwise typical grains (i.e., lacking features of significant shock) as the probable cause of the mottled or "frosty" appearance. Yang and Lin (2017) and Yang et al. (2019) determined that these are polycrystalline spinel micro-inclusions which coexist with diopside, corundum and forsterite grains. These microlite domains are considered to be evidence of in situ total remelting of primary plagioclase and partial remelting of primary pyroxene, followed by rapid cooling. While Goodrich et al. (2014) demonstrated that this melting was the result of a shock event, Yang et al. (2019) ascertained that the parent body was still hot with ambient temperatures of 10001100°C. In support of such an event, Weber et al. (2014) observed certain features of NWA 7325 that are consistent with a significant secondary heating event followed by rapid cooling, and they inferred that this meteorite was not formed in a deep-seated pluton; however, other studies demonstrate that it was not a surface rock. Utilizing infrared and Raman spectroscopy, Weber et al. (2015) identified multiple features in plagioclase and magnesiochromite grains in their sample which do not support the occurrence of intense shock associated with the secondary heating and melting event. Nevertheless, Hasegawa et al. (2014) suggested that the parent body experienced a catastrophic breakup while still hot accompanied by rapid cooling of portions of the mantle attested by this meteorite. Some vesiculation within the meteorite can be seen in thin section, attesting to a possible volatilization event during shock heating which is consistent with the presence of tiny degassing holes visible in some portions of the fusion crust. The initial bulk rock O-isotopic analysis was conducted at the University of New Mexico (K. Ziegler), with subsequent bulk rock analysis conducted at The Open University (Barrat et al., 2015; Weber et al., 2015). It was determined that this ungrouped achondrite plots within the highly scattered field of the ureilites and along an extension of the Δ17O trend line for the acapulcoitelodranite clan (NWA 7325**UREACA/LOD); however, the petrology of NWA 7325 is completely different from that for these and other known meteorite groups. Furthermore, on a coupled Δ17O vs. Fo% diagram, ureilite olivine core compositions and NWA 7325 bulk rock values are clearly resolved from each other (Barrat et al., 2015 and references therein). In a similar manner, other coupled diagrams involving multiple element pairs clearly resolve NWA 7325 from most other achondrite groups, including ureilites, angrites, brachinites, and martian meteorites, as well as from the ungrouped achondrite NWA 011; however, NWA 7325 plots in a similar space as other volatile depleted meteorites derived from the Moon and Vesta. Separate O-isotopic analyses for the major mineral fractions (plagioclase and pyroxene [Cr-diopside]) in NWA 7325 were conducted by Jabeen et al. (2014) (NWA 7325**UREACA/LOD). 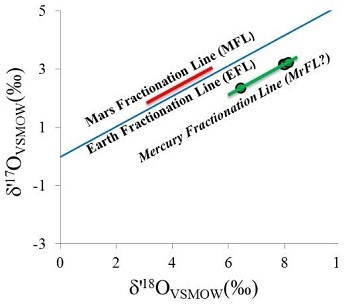 The triple oxygen isotope fractionation line plotted from their mineral analyses is shown below in comparison to that of both Earth and Mars. 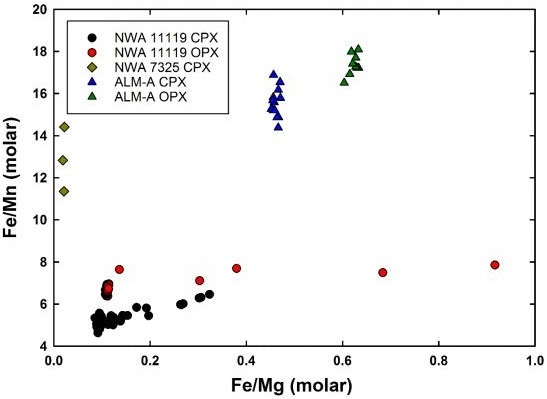 The mineralogical and geochemical properties of NWA 7325 are consistent with accumulation from a Ca-rich and Fe-poor mafic magma under highly reducing conditions. Sutton et al. (2014) utilized X-ray absorption spectroscopy for elemental analyses of olivine and pyroxene in NWA 7325 to discover the valency (oxidation state) of the Ti, V, and Cr. Based on the oxidation state of these multivalent elements relative to the iron-wüstite (Fe-FeO) redox buffer assemblage, the oxygen fugacity of the primary melt during crystallization of NWA 7325 was estimated to be ~IW-4.5; these highly reducing conditions are consistent with the redox state of the inner Solar System. While that may be true, results of high precision trace element analyses conducted by Weber et al. (2015) reveal some inconsistencies with a formation of NWA 7325 under reducing conditions; e.g., higher depletions of W in the silicates would be expected, resulting in higher Ta/W and Hf/W values compared to those observed. They suggest that the introduction of a metasomatic fluid (partial melt phase) with a high concentration of highly incompatible elements such as W and Nd (both due to their high field strength) could explain these low values as well as the unusually low Zr/Nb and Sm/Nd values. In an effort to better characterize the redox conditions under which NWA 7325 was formed, Sutton et al. (2017) determined the valences for a number of multivalent elements (Ti, Cr, and V) which can be informative of the oxygen fugacity at the time of silicate igneous crystallization. By employing these three elements in combination, coverage of the oxygen fugacity can be achieved over a broad range (~ IW11 to IW+4) consistent with that considered to have prevailed on the parent bodies of achondrites. Results of their study demonstrated that all three oxybarometers in olivine grains, as well as the Ti and V oxybarometers in pyroxene grains, are indicative of highly reducing conditions during formation of both NWA 7325 and the ureilite Y-791538 equivalent to a combined weighted mean of IW3.1 (±0.2) and IW2.8 (±0.2), respectively; notably, this oxygen fugacity value also falls within the broad range (~IW6 to 3) deduced by McCubbin et al. (2012) for Mercury based on MESSENGER data. Sutton et al. (2017) posited that the more oxidized Cr (IW+1) present in the pyroxene and plagioclase grains in NWA 7325 is attributable to a secondary shock-heating event. Hasegawa et al. (2014) suggested that the parental source melt composition for NWA 7325 was akin to enstatite chondrite with an added CAI-like component; however, Goresy et al. (2013) recognized a unique REE pattern and positive Eu anomaly associated with possible residual oldhamite, which would rule out derivation from any enstatite chondrite or aubrite. MESSENGER X-ray (XRS) and gamma-ray (GRS) fluorescence data analyzed by Nittler et al. (2013) indicate that significant compositional variation in Fe and other elements exists across the surface of Mercury (irrespective of a still incomplete global coverage, particularly of the northern hemisphere), but on average the near-surface bulk composition of the planet is relatively poor in Fe (<~4 wt% [~0.2~1.5 wt%]; Izenberg et al., 2013), Ti (<1 wt%), and Al; these average values correspond most closely to plains units. Furthermore, near-infrared reflectance spectra obtained from the Visible and Infrared Spectrograph (VIRS) instrument aboard the spacecraft, attaining a planetary coverage of >90% plus specific fresh craters (Klima et al., 2013), indicate that the FeO content of surface silicates (primarily Mg-rich orthopyroxene and plagioclase; Stockstill-Cahill et al., 2012) can be constrained below ~2 wt% (ave. ~1 wt%; Weider et al., 2013); this value is in broad agreement with the 1.57 wt% FeO constituting this meteorite (Irving et al., 2013). Other XRS and GRS data utilized by Vaughan et al. (2013) indicate that a relatively high abundance of S (and certain other volatile elements) exists across Mercury's surface, contrary to favored theoretical predictions, with measurements showing up to ~4 wt% (ave. ~2 wt%) (Evans et al., 2013). Given the hypothesized formation environment that existed on Mercury, a high probability was found for about half of the S abundance to occur as FeSFe being the limiting factorwith the remainder occurring as CaS (oldhamite) without MgS. Another Ni-bearing iron component is believed to exist on the surface as free metal derived from impact debris. The very low abundance of FeO on the surface is thought to reflect the sequestration of Fe under very reducing conditions and high temperatures into the unusually large core (>50 vol%). In a similar manner, it is argued by Hillgren and Fei (2013) that Si would likely experience a mutually high sequestration into the core under these conditions, leaving a high S abundance in the mantle. An experiment was conducted by Vaughan et al. (2013) in an effort to synthesize the products of a mercurian magma. The batch contained the elements in the proportions detected in the bulk composition of surface material on Mercury by XRS. The experiment was run under the hypothesized formation conditions that existed including temperature, pressure, redox, and cooling rate. The resulting mineral assemblage included forsterite, diopside, and sulfides, the latter including FeS and CaS but no MgS. Relatively high abundances of Ca are present in NWA 7325, with a significant occurrence of residual oldhamite being reported by Goresy et al., 2014). However, this Ca-sulfate component was interpreted by Barrat et al. (2014, 2015) as more likely representing a product of terrestrial weathering. XRS and GRS values for Ca from partial coverage of the planet's surface are relatively low (although higher values are present in certain regions; Nittler et al., 2013), suggesting a general low abundance of plagioclase minerals (Weider et al., 2011, 2013). In a like manner, Evans et al. (2013) analyzed the data as it pertains to volatile abundances on the surface, finding variable Na abundances across the planethigher in the smooth plains (3.95.2 wt%) compared to the heavily cratered terrain (0.72.9 wt%). Alternatively, the high and low Na abundances might instead correspond to the cooler polar regions and warmer equatorial regions, respectively. Both telescopic observations and petrologic modeling of Mercury's crust suggest that there should be a significant component of Na-rich plagioclase in some regions, although none has been reported thus far in NWA 7325. It was argued by some that any significant discrepancies that may exist between the expected abundances of Ca and Ca-bearing minerals on Mercury's surface, compared to the actual abundances measured in NWA 7325, may be mitigated by a scenario in which the meteorite formed at significant depth involving fractionation processes in the parent melt, and/or it formed in a highly reducing environment. Other considerations may be invoked to account for the lack of sodic plagioclase in this meteorite. Further investigation is also needed to account for the apparent heterogeneity in elemental abundance ratios which exists across the planet as demonstrated by many research teams (e.g., Izenberg et al., 2013). Modeling of the parent body of NWA 7325 was conducted by Archer et al. (2015) in consideration of the observed low abundances and unique fractionation profile of highly siderophile elements (HSE), as well as the ReOs isotopic data. The HSE characteristics of the meteorite samples are inconsistent with a simple one-stage model involving metal-silicate segregation during core formation, but a multi-stage formation scenario can produce a very similar HSE signature to that of the samples studied. It was proposed that initial melting and differentiation of a chondritic body resulted in a 70:30 compositional ratio comprising silicate mantle and FeNi-metal core, respectively. Thereafter, late accretion and incorporation of a small exogenous chondritic component was succeeded by an equilibration event. Then ensued another episode of metal-silicate segregation, followed by lithification of the meteorite source rock. A final addtion of a small volume of CI-like chondritic material ultimately resulted in a rock with HSE characteristics very similar to those of the NWA 7325 meteorite fragments used in this study. Based on petrographic, chemical, and isotopic analyses of NWA 7325, Barrat et al. (2015) proposed an alternate formation scenario. In consideration of multiple features inherent in the meteorite, including heterogeneous HSE distribution, very low abundances of incompatible elements, very large Eu anomaly, and high δ26Mg* value, and with regards to the AlMg systematics for the meteorite, they concluded that the meteorite represents in situ crystallization of an impact melt rather than a cumulate derived from a melt. This impact-melting and crystallization event occurred ~4.5628 b.y. ago from a gabbroic host protolith calculated to have formed ~4.566 b.y. ago. In contrast to the scenario presented by Archer et al. (2015) described above, and more consistent with the unbrecciated nature of NWA 7325, Barrat et al. (2015) argue that the addition of the small exogenous chondritic component (≈0.2 wt%) occurred prior to crystallization of the meteorite source protolith. Through chronometric studies of NWA 7325 based on the UPb isotopic system, Amelin et al. (2013) ascertained an ancient age of 4.5625 (±0.0044) b.y. The AlMg age for NWA 7325 relative to the D'Orbigny angrite was calculated by Dunlap et al. (2014) to be 4.5628 (±0.0003) b.y., which matches the PbPb chronometer. The importance of an accurate and precise determination of the crystallization age for this unique achondrite led Koefoed et al. (2016) to conduct careful analyses of the UPb and AlMg systems. Employing the precise 238U/235U value of 137.794 (Goldman et al., 2015), their most reliable PbPb isochron age is 4.5634 (±0.0026) b.y., while that for the AlMg chronometric system anchored to D'Orbigny was found to be accordant, providing a very precise determination of the crystallization age at 4.56309 (±0.00026) b.y., or 4.2 m.y. after CAIs. A larger sample of the paired meteorite NWA 8486 was analyzed by Cartwright et al. (2016) in order to better resolve the UPb age. They derived a best age of 4.5639 (±0.0017) b.y. In addition, Koefoed et al. (2016) utilized AlMg systematics to estimate the timing of differentiation of the meteorite parental source melt, establishing that this stage occurred within 1.721.80 m.y. after CAI formation. The unusually high abundance of radiogenic Al inferred to be present at the time of crystallization has implications for its distribution in the early solar system, and helps to establish that NWA 7325 originated on a unique parent body very early in solar system history. Additional age dating of NWA 7325 based on Ar chronometry was conducted by Hopp et al. (2018). They derived an ArAr age, corrected for the accumulated terrestrial atmospheric argon component, of 3.200 (±0.260) b.y. ; this likely represents an upper age limit for a late-stage impact-induced degassing event. The 3He and 21Ne cosmogenic noble gas data of Hasegawa et al. (2014) provide a CRE age for NWA 7325 of ~20 m.y., which is consistent with the Xe- and Ar-based CRE age determined by Weber et al. (2015) of 18.818.9 m.y. A precise calculation process was employed by Hopp et al. (2018) to better resolve the CRE age based on cosmogenic 38Ar, and an age of 17.45 (±0.12) m.y. was derived. This age is seemingly in accord with the age determined by Weber et al. (2015), but actually the two ages are at variance when the same calculation procedures are usedthe Weber et al. (2015) age would then be 13.514 m.y. After a thorough assessment, the CRE age discrepancies could only be attributed to compositional heterogeneity with respect to noble gases. The finding of such a very ancient crystallization age for this meteorite runs counter to expectations for an origin on a planet the size of Mercury, as this is an age intuitively expected for a relatively small, rapidly cooled asteroid (Dunlap et al., 2014). Furthermore, this crystallization age is indistinguishable from that calculated for other ungrouped achondrites such as NWA 011 and NWA 6704 (Koefoed et al., 2016). That said, there have been very ancient crustal samples (or components therein) delivered to Earth from the larger planet Mars; until better knowledge of the formation history of Mercury is obtained, a genetic relationship with NWA 7325 should not be ruled out. A report on the Xe-isotopic systematics of NWA 7325 describes an elevated 129Xe component considered likely to be from the radioactive decay of 129I (Crowther et al., 2014; Crowther and Gilmour, 2015). This elevated 129Xe could be the result of the decay of primary 129I (half-life = 16 m.y.) that was incorporated early in Solar System history, or possibly it was acquired much later from a reservoir containing an evolved Xe component; the latter case would require heating and then closure of this chronometer after several 10s of million years had passed, possibly associated with the secondary heating and melting event inferred from petrographic analyses (e.g., Weber et al., 2015). Additional constraints on the origin of this meteorite have been established through studies of the Cr-isotopic systematics (Sanborn et al., 2013, 2014; Kita et al., 2014). The resulting ε54Cr value of 0.55 (±0.08) resolves NWA 7325 from both the ureilites (ε54Cr ~ 0.9; Yamakawa et al., 2010) and the acapulcoitelodranite clan (ε54Cr = 0.75; Göpel and Birck, 2010)groups for which discrimination through O-isotopic values alone had not been attained. In a similar view, mineralogical and trace element studies conducted by Goresy et al. (2014) provide further evidence against a genetic relationship between NWA 7325 and either the ureilites or the enstatite chondrites and aubrites. 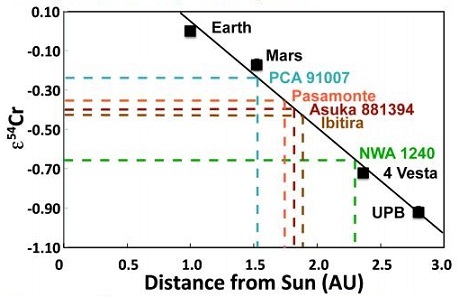 Sanborn and Yin (2014) compared various meteorites utilizing a ε54Cr vs heliocentric distance coupled diagram (see below). The ε54Cr value of 0.55 (±0.08) calculated for NWA 7325 does not plot in the present location expected for Mercury, unless the planet is considered to have formed at a greater heliocentric location before migrating inward. Interestingly, inward migration follows the scenario proposed by Asphaug and Reufer (2014) in light of their hydrocode simulation of a hypothetical Mercury-forming hit and run collision (see below). They theorized that a differentiated chondritic impactor (proto-Mercury) having 25% the mass of Earth could have collided with proto-Venus at a given velocity and angle so that the mantle of the impactor was stripped and dispersed, leaving a largely metallic secondary body which matches the mass (5.5% the mass of Earth) and composition (~70 mass% metallic iron) of Mercury. Further modeled data pertaining to this hypothetical collision can be found in the The Astrophysical Journal article 'Formation of the Terrestrial Planets from a Narrow Annulus', Section 3.1. Origin of Mercury, by B. Hanson (2009). Simulation of a hypothetical Mercury-forming hit and run collision from Erik Asphaug. As expressed by Sanborn et al. (2014), a coupled Δ17O vs. ε54Cr diagram is one of the best diagnostic tools for determining genetic relationships between meteorites. Moreover, Sanborn et al. (2015) demonstrated that ε54Cr values are not affected by aqueous alteration. The diagram below, shown courtesy of Goodrich et al. (2017), compares the Δ17O and ε54Cr isotopic composition of NWA 7325 with other achondrite and carbonaceous chondrite groups. In their study of the fossil meteorite Österplana 065, Schmitz et al. (2016) included oxygen and chromium isotopic data for NWA 7325 in a coupled Δ17O vs. ε54Cr diagram (shown below). This higher resolution diagram clearly demonstrates that this meteorite plots in a distinct location in isotope space, indicating that it derives from a unique parent body. 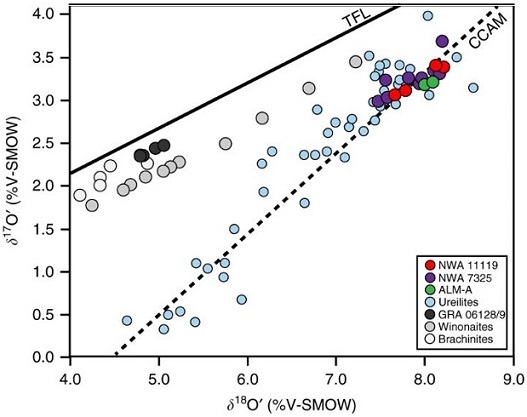 Microprobe results for trace element abundances in NWA 7325 show depletions in highly incompatible elements (Kita et al., 2014). It was noted that close similarities exist between element depletions in both NWA 7325 and an An-rich plagioclase clast found in the DaG 319 polymict ureilite. It was argued that a low-degree partial melt phase, which was responsible for the sequestration of highly incompatible elements from both NWA 7325 and the An-rich plagioclase clast, preceded the formation of both lithologies on their respective parent bodies. Furthermore, it was suggested that both of these planetesimals experienced low-temperature aqueous processing prior to differentiation, which was made possible by abundant accreted water ice that is most prevalent in the outer solar system; therefore, it was asserted that NWA 7325 likely originated on an asteroid similar to the ureilite parent body with which it shares some similarities in petrogenetic history. To date, six feldspathic clasts have been identified in polymict ureilites (see further details on the DaG 319 page) which have mineral and O-isotopic compositions as well as fine textures remarkably similar to NWA 7325 (Goodrich et al., 2017). They consider it plausible that these clasts represent xenolithic fragments derived from the NWA 7325 parent body. Further comparisons utilizing a possible second sampling of the NWA 7325 parent body, the 453 g NWA 11119 (photo courtesy of Carl Agee; see also photos below), should be elucidating. Results of petrologic and isotopic analyses of NWA 11119 conducted by Srinivasan et al. (80th MetSoc, 2017, #6129; Nature Communications, 2018, #3036) reveal that this meteorite has essentially identical O-isotopic values to NWA 7325, both are depleted in alkalis, and both contain a high abundance of calcic plagioclase and Cr-bearing clinopyroxene (bright green diopside). Utilizing a coupled Δ17O vs. ε54Cr diagram, Huyskens et al. (2018) demonstrated that the two meteorites overlap within uncertainties (see diagram below below). Unlike NWA 7325 however, NWA 11119 has an andesiticdacitic bulk composition, has a unique Fe/Mn ratio (indicative of an origin on a previously unsampled parent body), is significantly more oxidized, lacks olivine and metal, and contains a uniquely high abundance (~22%) of silica polymorph in the form of tridymite (Srinivasan et al., 2018). In addition to tridymite, cristobalite and rare quartz was reported in Hoffmann et al., 2018, #2468). Both its fine-grained vesicular texture and its silica-rich composition are consistent with an evolved lava associated with a relatively early (within ~3 m.y. of solar system history) volcanic eruption. Based on AlMg chronometry, Srinivasan et al. (2018) calculated an age of 4.5648 (±0.0003) b.y. for NWA 11119 relative to the D'Orbigny angrite. This age is nearly 2 m.y. (~1.7 m.y. based on replicate data) older than that calculated for NWA 7325 and is among the oldest determined for a meteorite thus far. Notably, Wimpenny et al. (2019) calculated an AlMg age for the anomalous A-881394 of 4.56483 (±0.00021) b.y. when anchored to the D'Orbigny angrite, while an age up to 1.26 m.y. younger was obtained when anchored to certain CAIs. They also calculated a similar MnCr age for A-881394 of 4.56441 (±0.00032) b.y. anchored to D'Orbigny. In addition, employing the measured 238U/235U value of 137.768 (±0.038), they determined the most precise and accurate PbPb isochron age for A-881394 (possibly related to Bunburra Rockhole) to be 4.56495 (±0.00053) b.y. ; this is the oldest meteorite dated utilizing UPb chronometry. In their study of NWA 11119, Srinivasan et al. (2018) determined that the O-isotopic composition and AlMg age data are reasonably consistent among several different achondrites: the ungrouped NWA 11119 and NWA 7325, and the trachyandesite clasts in the Almahatta Sitta anomalous polymict ureilite (MS-MU-011/ALM-A and MS-MU-035). In addition, some notable geochemical similarities have been identified. Moreover, it was recognized that these are the only achondrites known that plot on the carbonaceous chondrite anhydrous mineral (CCAM) line at the high-δ18O end. Although these meteorites do have distinct Fe/Mn ratios, the range in values is much less than that within the acapulcoitelodranite clan, the latter of which is known to represent a single parent body. The many similarities that have been documented among these diverse meteorites suggest that a genetic relationship (i.e., a common differentiated parent body) may exist (see diagram below). For additional information on the NWA 11119 meteorite, read the PSRD article by G. Jeffrey TaylorThe Oldest Volcanic Meteorite: A Silica-Rich Lava on a Geologically Complex Planetesimal, Aug 2018. It is noteworthy that Vaci et al. (2018) recognized another ungrouped achondrite, NWA 5517, that might plot along an extension of the O-isotopic trend line for NWA 7325, NWA 11119, and the trachyandesite clast ALM-A (not plotted below). This meteorite has a poikiloblastic texture composed of 56 vol% equigranular olivine, 42 vol% clinopyroxene (Cr-diopside) oikocrysts enclosing smaller olivines, and 2 vol% FeNi-metal and troilite (Bunch and Wittke, NAU; D. Rumble III, CIW). Northwest Africa 5517 is a sub-TFL achondrite that is not derived from the carbonaceous chondrite reservoir, and it could possibly represent a mafic relative of the other two intermediate meteorites. Early in solar system history a number of planestesimals grew to protoplanetary and even planetary sizes, underwent gravitational differentiation, and developed a rotating core dynamo that produced a weak magnetic field. Evidence for this is found in the paleomagnetic signatures detectable today in their associated achondritic meteorites. The strength of the natural remanent magnetization of the NWA 7325 meteorite was measured in paleomagnetic studies conducted by Weiss et al. (2013, 2017). While a measurable paleomagnetic signature has been detected for all achondrites studied to date, some reflecting the parent body surface magnetic fields at the time of their formation measuring hundreds of microteslas (µT = unit of magnetic field strength), the magnetic paleointensity of NWA 7325 at the time of cooling was found to be negligibleless than ~1.7 µT. This is comparable to the magnetic field intensity on the surface of Mercury as measured by the MESSENGER spacecraft. as revealed by the MESSENGER spacecraft. The core makes up ~85% of the planet. A methodical and systematic analysis of the delivery criteria for a mercurian meteorite was presented by W. Vaughan and J. Head (2014), with reference to current improved data obtained by the MESSENGER spacecraft. In lieu of providing a synopsis of their conclusions here, their concise LPSC abstract is best read in its entirity. Although the transfer dynamics of ejecta from Mercury to Earth are more complex than delivery from Mars, the probability of finding a Mercurian meteorite may be higher than once thought. Since the acquisition of geochemical data from orbit is significantly affected by the high surface temperatures on Mercury, verification of a mercurian origin for NWA 7325 must await better methods to obtain ground truth. In a noble gas study of NWA 7325 conducted by Hopp et al. (2018), a shielding analysis was used to infer a relatively small pre-atmospheric radius for the parent meteoroid of NWA 7325 of a few decimeters (1 ft = 3.048 dm). For further information about the criteria for identifying a mercurian meteorite, visit the Indicators of a Mercurian Meteorite page on this website. The specimen of NWA 7325 shown above is a 0.379 g cut fragment. The photo collage below shows some of the stones obtained by Stefan Ralew which were classified as NWA 7325.